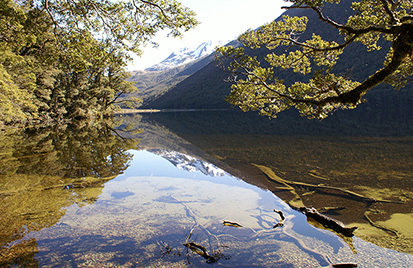 Lake Rere lies not far from the renowned Greenstone Track on the western side of Lake Wakatipu. Popular in the 1800’s as a destination for steamer excursions, Lake Rere is a great spot for a picnic and a swim. This 5 – 6 hour loop track takes you through beautiful beech forest up the Greenstone valley to the placid jade waters of Lake Rere. Enjoy the mirror reflections of the lake before returning via Elfin Bay and across the headland to the Greenstone carpark. The terrain is varied and relatively easy walking, meandering through native red beech forest, crossing through open farmland and fields, before returning along the shores of Lake Wakatipu. Native birds can be seen on the track, and occasionally deer are spotted. This hidden gem offers a great variety of landscapes and an easy day in the mountains.